Cornwall is the county that juts out into the Atlantic Ocean in the south west of England. Because of the Gulf Stream that carries warm currents to Britain and its southerly location, Cornwall tends to have warmer summers than many other places in Britain. It also has a long rugged coastline dotted with sandy beaches and secluded bays. There are old fishing harbours and granite cliffs colonated by sea birds where wild flowers thrive. Cornwall is popular but most people gather in the tourist locations but you can find plenty of quiet secluded spots for a peaceful holiday. 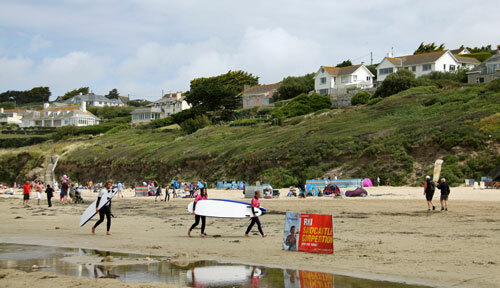 Self catering holidays in rented holiday cottages, houses and apartments are very popular. The one drawback of a holiday in Cornwall can be the road in and out of Cornwall where traffic crawls on changeover days of Fridays and Saturday when people pack up and go home or arrive. It is possible to avoid much of this by coming for a mid week short break or arriving a day earlier and staying in a B&B or hotel for one night en-route. That not only breaks up your journey, especially if you're travelling a long way south in Cornwall, such as St. Ives, and also gives you the opportunity to take a look around another location in Cornwall. The other way of missing the great tourist summer holiday crush is to take a holiday in Cornwall in May, June, September or early October when the weather can be lovely and you can have Cornwall to yourself. They're generally considered ideal months for a beach holiday although May and June often surprise us with an early heat wave and some of the best weather. What you could do is to obtain a weather forecast for Cornwall and perhaps try for a last minute cottage holiday or take a look at historical weather records.